To many, the mere words conjure up visions of wealth! Of hitting it big, of striking it rich! 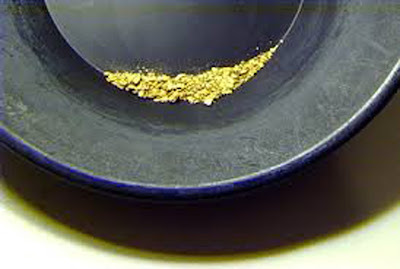 To others, with a love of horse flesh, one immediately conjures up a vision of the famous Gold Dust. 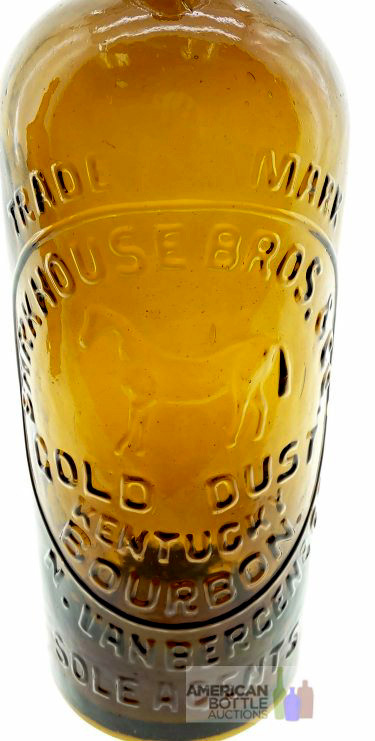 "Golddust" was all the rage in horse racing circles during the 1860's. He was a Morab, (a combination of Morgan and Arabian), sixteen hands high, and was pure gold in coloration. His speed and refinement were legendary, and his name continued to be a conversation topic in racing circles for decades. The artist obviously missed the fact that he was pure gold in color in this woodcut, but his conformation and elegance are quite evident. He was so legendary that around 1871 the firm of John Van Bergen & Co. (brother Nicholas was part of the "& Co.") decided to name a brand of whiskey that they were introducing after him. That brand? "Gold Dust Kentucky Bourbon". The brand was registered on November 25th, 1871. 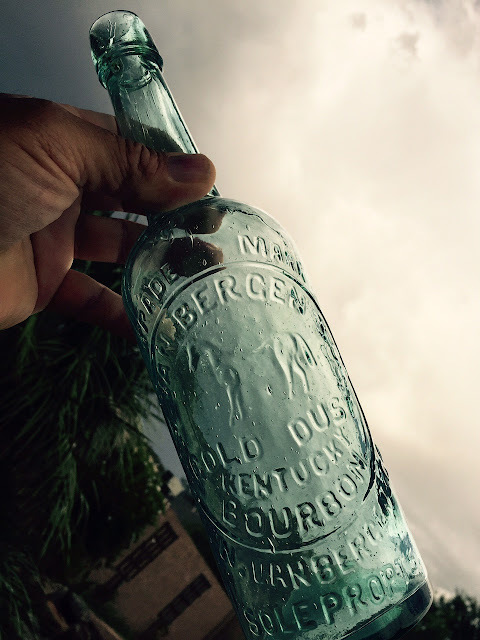 The source of the bourbon was the small Barkhouse Bros. Distillery located in Louisville, Ky. In keeping with the trend of the times, they commissioned a mold for their new brand with the bottles bearing a likeness of the legendary steed. The bottles were blown in the customary amber glass, which was popular at the time. 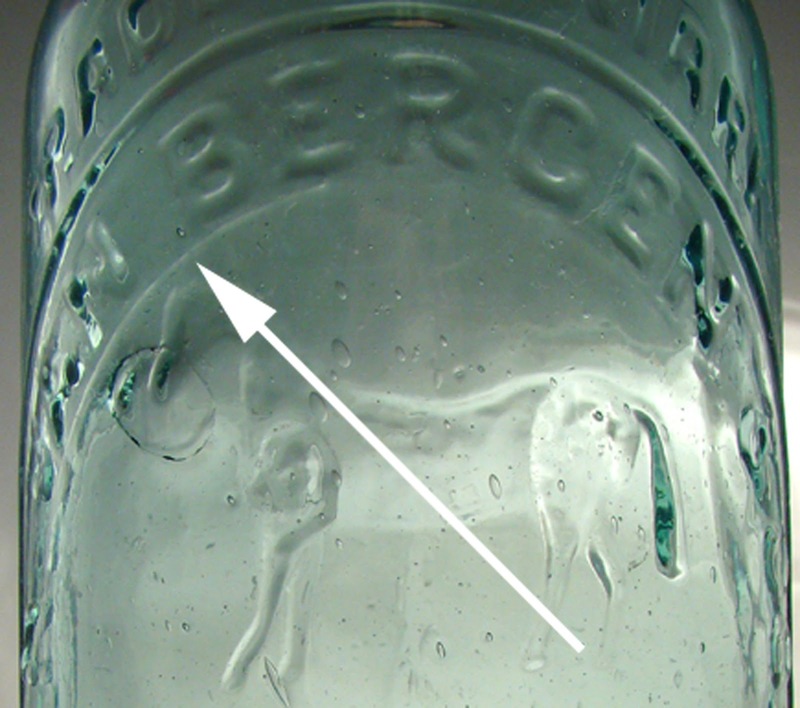 The serif "R's" are testament as to the glass works of origin. This mold was used for roughly four years. In 1874 Nicholas took over the reigns from brother John and the firm was renamed N. Van Bergen & Co, (no doubt because the name Nicholas would have taken up far too much space in the embossing). The mold was reworked by peening out Johns name and replacing it with the initial "N.". This modification to the Barkhouse Bros mold is evident on examination. 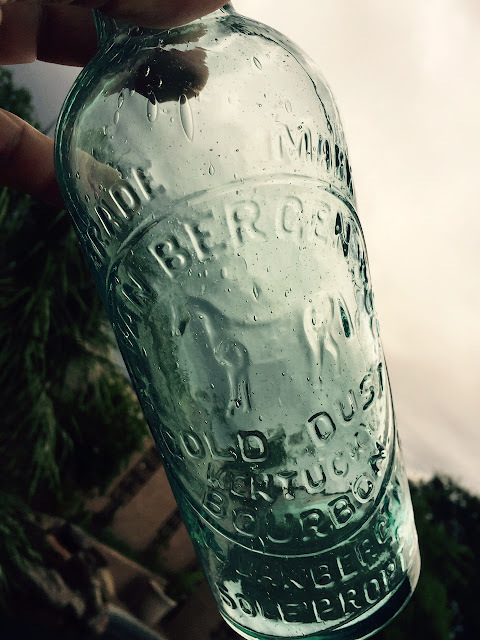 The bottles continued to be blown in amber glass. Business continued on as usual with sales moving at a brisk pace. The brand had gained widespread acceptance by both gold miners and in the booming Comstock area of Nevada. 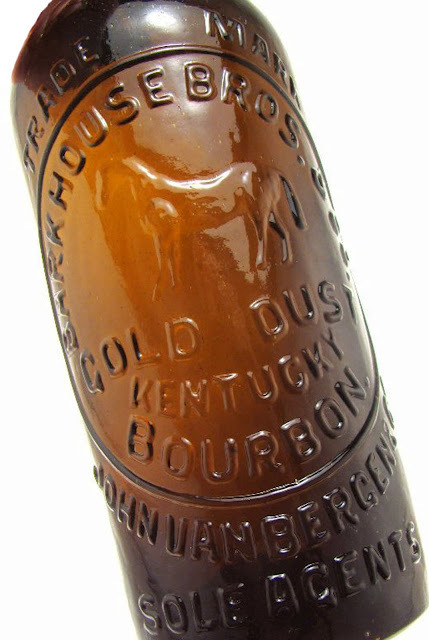 According to Thomas, Barkhouse Bros. sold the trademarked brand to N. Van Bergen in 1876. For whatever reason, N. Van Bergen opted to have "Barkhouse Bros. & Co." removed from the mold, and had his name inserted where Barkhouse Bros. had originally been. Again, this was accomplished by peening out the original script and adding new lettering to the aging mold. Another change was instituted at about this time; a change from amber to aqua glass. A later, subsequent and final change occurred when "Agents" was peened out and replaced with "Props." (proprietors). This final version of the revamped mold was used for a few more years, until roughly 1880 +/-. It was about at this point in time that the original / reworked mold, began to wear out. A glance at many of these bottles reveals weakened lettering and a horse that has become nearly non-existent in terms of the depth of strike. The final, new, applied top mold came into use in approximately 1880 +/-. This variant was in use for a very short period of time and is easily distinguished by the extremely strong (yet still "play-dough" style) embossing in the lettering and the bold and prominent horse. Based on my observations, this is the toughest of the aqua Gold Dust variants to obtain, and the number of bottles blown in this new mold must have been comparatively few. Later, three distinctly different tool top molds were used to bottle the product. With a total of at least six different variants, one can assemble quite a run of the Gold Dust series. My favorite has always been the final "new" Aqua glop top mold. I spent many, many, years looking for the "perfect" example. As with any top shelf western picture whiskey, the 3 "C's" are critical. They are, color, crudity and condition. I'll introduce one more just to muddy the waters; a crude top. I think that the final bottle pictured in this write-up epitomizes these criteria. Send me photos of your perfect Gold Dust! Here's the first submission. Top Shelf!